Welcome to day four of the Stampendous/DecoArt blog hop - hope you've been enjoying all the inspiration so far! 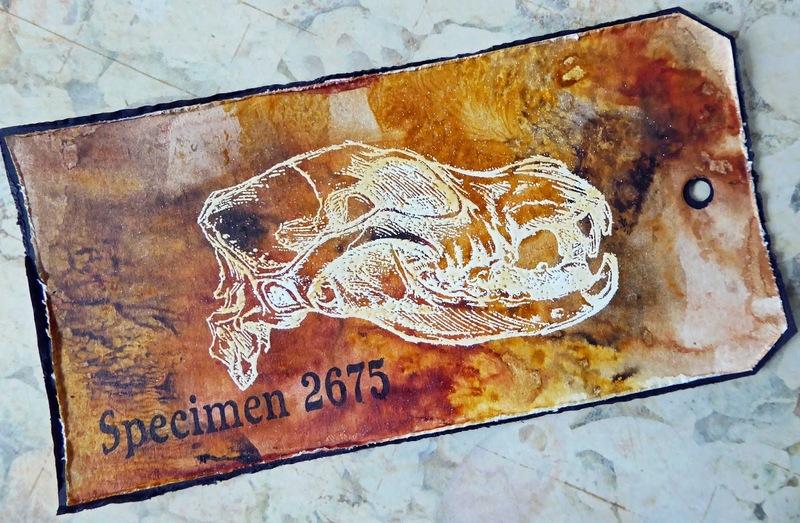 Today I've used Andy's Skulldoggery stamp set to create a kind of faux fossil effect on a tag. Comment for a chance to win one of three HUGE prize packages that includes Andy Skinner stamps and DecoArt Media™ Paint plus more! US winners only, see Stampendous Official Contest Rules here for more details. 1 Cut a tag from mixed media or watercolour paper - something that can take wet media. 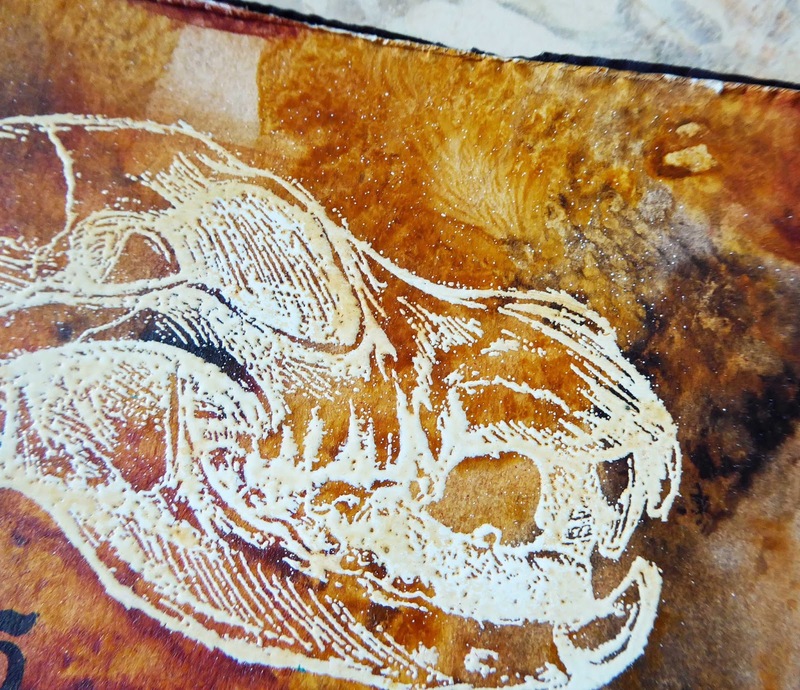 2 Squeeze drops of Yellow Oxide, Burnt Sienna and Raw Umber paints onto a craft sheet or other non-stick surface. Spray generously with water. 3 Swipe the tag into and through the paints - lightly so as not to over-mix the colours. Dry and repeat until you like the result. I was aiming for a look similar to natural rock (did I manage it?). 4 Stamp and heat emboss the skull stamp with white Stampendous embossing powder. When cool, add a wash of Yellow Oxide paint to tone down the white a little bit and blend the skull into the tag. 5 Finally stamp the wording in black, distress the edges of the tag and mat onto black cardstock. Your tag is very cool and neat!!! I am really digging this stamp!! I know that my 13 year old grandson is going to have a blast creating with it once I can afford to purchase it! Today is his 13th Birthday and I know he would love a card made using this image!!! Your tag is awesome! I love how it is distressed and that image ROCKS!!! TFS! You did achieve the look of a rock background. Very cool. I am really liking the versatility of this stamp. It just always looks cool. Wondering what SPECIMEN 2676 looks like... NOT!!!! Heheheh!!! This really looks like on old vintage specimen tag Katy. I love how Andy's "relic" comes to life on your background. SUPER FINE! Xj. You did achieve the look of rock (or aged wood). off the tag. 2656 is a fearsome-looking specimen. I love the look of the background. Such a cool look and to emboss the skull what a great idea. I love your tag. Amazing work. The coloring on the tag is gorgeous! Wow, what a fantastic tag! Awesome coloring on this tag! Love your tag and the background colors look awesome! Great idea to emboss the image in white! Thanks for sharing! What a fun project! I love seeing all these wonderful ideas! Gorgeous tag- I love the vintage worn look you have achieved!